Colin grew up in the 1970s in D C Thomson country, so there was no doubt that Colin was going to be a comics fan. As Colin got older, his tastes widened from the British weeklies and Picture Libraries to the delights of Deadline, Crisis and Revolver but he still continued to enjoy 2000AD, Commando and the Megazine. With the advent of the internet, Colin and Karen’s (yes Karen is also a comic fan with her favourites being Misty, Vampirella, Action, Battle, Alan Class and Victor!) collection exploded from a few hundred 2000ADs to over 15,000 comics and annuals covering the majority of the highlights of covering the majority of the highlights of British comics and it is still growing. In this time a new comic love grew and Colin began to carry out his own research into the contributors to British comics scene and even got two stories published in the Misty fanzine specials of the 2000s. Colin has written articles for Down The Tubes and writes for his own blog www.nothingbutafan.wordpress.com and has just contributed to the mammoth Fanscene published by David Hathaway-Price with the definitive article on the two Commando annuals of 1988 and 1989. First off a cover by Ian Kennedy. It just has to be. The size of the comic would be A3. The first story was good enough for Misty so it’s good enough for me. The Sentinels with art by Mario Capaldi. Sticking with futuristic Nazis, it’s back to the future with Return Of The Stormtroopers from Champion with Eric Bradbury’s fantastic art. Set in a future where war has been eradicated, who could predict the return of the Nazis in 2066 when they were awakened from suspended animation? And then we go far into the future with the fabulous Supercats. And with such glorious art by Badia Romero, who is going to argue with that? The Fab Four were adventurers throughout the galaxy and would use their skills to solve mysteries. 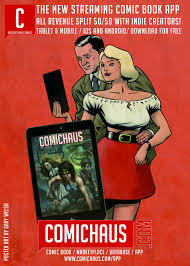 While they may never have said jinkies, they are still the closest that D C Thomson came to publishing anything pornographic. If you don’t believe me, go and look at Axa! It’s all a bit heavy so far so let’s lighten the mood a touch with some humour that’s a little bit political with Big Dave from 2000AD. Drawn by Steve Parkhouse and written by Millar and Morrison, it’s in your face humour that is so slapstick you have got to laugh. The good thing is that when you finish with the Big Dave stories, you can then go on to the BoJeffries Saga. I know there are a lot of fans that despise Big Dave, but that’s fine. The world would be a lot poorer if we all like the same thing. Next up is a sporting tale and here I am in a quandary as there were three artists associated with this character, Jack Glass, Juan Ripoll and Neville Wilson. And I think that I am going to have to go for the Neville Wilson version as he is the man I think of when I think of anyone as The Amazing Wilson! Check out this website for more. The centre pages would be in glorious colour and it would be the punishment battalion that took on all the dirty jobs on the Russian front which would be Kampfgruppe Falken with stunningly realistic art by Collado Coch and a gripping story from WW2 veteran Alan Hemus. For a story that was in a comic that supposedly glorified war, Kampfgruppe Falken manages to rub away a lot of the glory as the story moves from the successful advances of Operation Barbarossa to the dying days of the war in a bombed out Berlin. My next story is another war story, but this time it would be another classic that rubs away a lot of the supposed glorification of war in comics and this would be one of the few stories set in Vietnam where Colonel (Retired) Walter Mann USMC, is trying to find out what has happened to his son who has been posted as Missing – Believed Deserted in 1967 when he and his Phantom jet disappear without trace over the South Vietnamese jungle. Fighting Mann is a belter of a story written by Alan Hebden and gloriously beautifully illustrated by Cam Kennedy. My next pick is also from the pen of Alan Hebden and could send you into a meltdown when you see Massimo Bellardinelli’s art depicting Nick Stone and the Yujees as they fight to gain their freedom. The Meltdown Man is a seminal story. And I move the reader from one futuristic battle to another with Arena from Crunch. Stunning art from Quique Alcatena takes this futuristic gladiator story to the next level where Mark Sabor finds that to survive in the arena, he does not need to just fight his opponents but he needs to lead a revolution to free the people of the Earth. To round off this comic, I am going to have to include another example of one of my favourite comic genres and that is UK invasion stories. As I type this two stories are screaming at me. One is Invasion! from 2000AD and features one of my all time favourite characters Bill Savage. The other is Holocaust Squadron from Warlord where a multi-national force from WESFED ends up combatting the might of ASBLOC. The central character is Hob Hoggett and is drawn with his usual style by Terry Patrick. This time I am going to have to go with Holocaust Squadron as it does not get half the attention it deserves. But I still have the back cover to play with so I am going to go with full colour reproductions of Ron Smith’s western Lone Wolfe from The Beezer. Lone Wolfe was a cowboy hero like Roy Rogers where he would be out righting wrongs and making sure no wrongs were there to be righted! And the name of the comic would be ‘Legend’. For all the artists are legends and deserve to be much more appreciated than they are. ComicsFlix would like to thank Colin for his fantastic contribution to ‘My Perfect Comic’. if you like this feature you are going to love our new mail order subscription magazine ‘ComicScene UK’ – first issue out in May. Pre order here.